Mark Hemel and Barbara Kuit and their practice Information Based Architecture from Amsterdam, designed the Canton Tower while competing in 2004 in an international invited competition. It asked for the design of the tower, a 17.9ha park at its base and the master-plan for the surrounding 56.6ha which includes an elevated Plaza, pagoda-park, retail facilities, offices, television centre and hotel. In the competition for the Guangzhou TV & Sightseeing Tower they cooperated with Arup, initially their Amsterdam office, then later their offices in London, Hong Kong and Shenzhen. Most of the other offices participating in the competition were large commercial practices with lots of high-rise experience – Cannon Design, KPF, Richard Rogers and Coop Himmelb(l)au, among others. 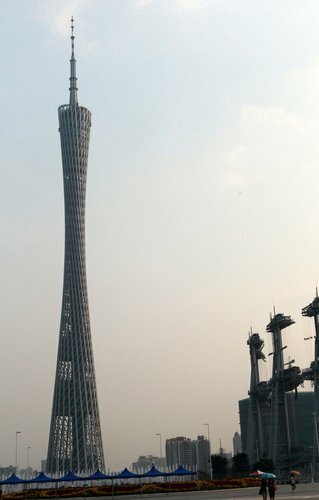 After 6 years of design and building works, on September 30th 2010 the Canton Tower has opened its doors to the public. The Guangzhou Tower is one of the world?s most spectacular new buildings. It is not only the world’s tallest TV tower (610m), beating Toronto’s CN-tower (535m), but also one of the most beautiful structures. In November 2010 the transformation of the metropolis of Guangzhou will be completed. During that month Guangzhou will be the host to the 16th Asian Games. The Guangzhou TV & Sightseeing tower, by then fully completed, will be the centerpoint of the festivities. The tower will be one of the tallest buildings in the world – reaching 610m in height and it is hoped will attract 10 000 visitors daily. The Asian Games will will be held in Guangzhou, China from 12 – 27 November. The top deck at +460 m is designed as a sloping elliptical square of 54 by 42 meter, where one can sit down and enjoy the panoramic view. Here one can feel the effects of the super-high rise physically. One can feel the reduced temperature, see far on clear days, taste the clouds on a cloudy day, and possible feel the structure sway in the wind. The top is shaved off diagonally, not toward the N-S central axis, but instead N-W towards the old city center, so that while sitting there one can oversee both new and old, and so the tower ?s form becomes an instrument symbolically bridging between the old and the new. These mega-spaces in between the mini-buildings are in fact floating gardens each varying in atmosphere; transparent, light and open at the base, and more closed and shaded at the waist of the tower. Voor wie meer wil weten over het lichtontwerp van de toren. De buitenverlichting is kleurrijk en dynamisch, en verbruikt dankzij de toepassing van LED slechts 15% van de energie die volgens de Chinese standaard is toegestaan voor gevelverlichting!